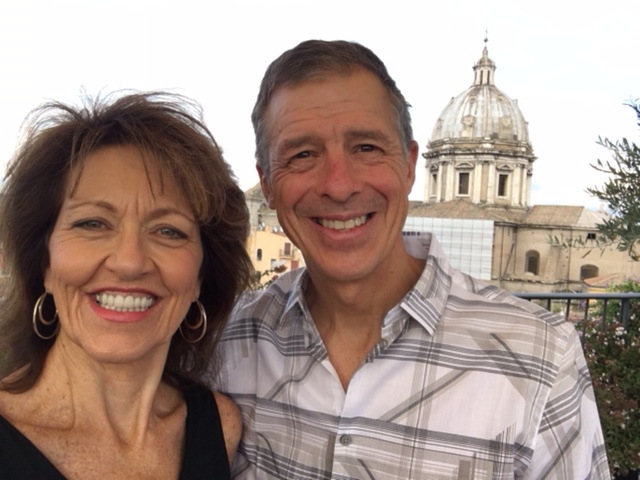 On our first evening in Rome, sitting on a beautiful terrace overlooking the entire city, my partner of 12 years proposed! I could not have been more surprised and was actually speechless until Neil finally asked after several minutes if I was going to say yes! (I did). I don’t always have to be in charge of everything and letting go of the control I think I have opens me up to the magic of surprise. That moment is imbedded in my memory forever and so is all the thought and planning Neil did to create it. 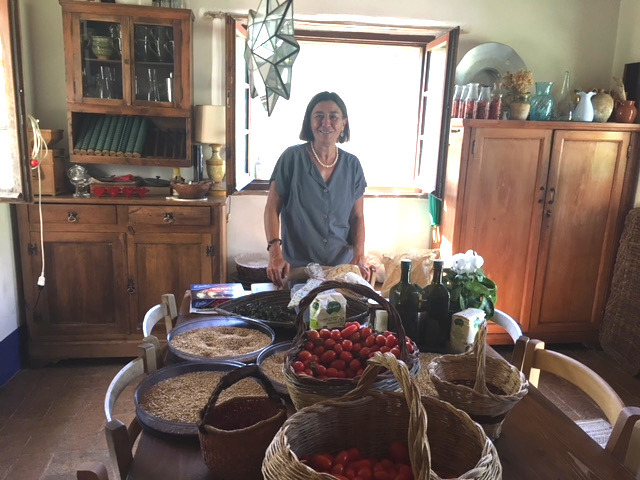 The Italians put a lot of love and passion into their food with the freshest ingredients and conscientious planning, preparing and consuming. The process gives slow food a whole new meaning with multiple courses and plenty of time to savor in between. My rushing keeps my mind always on the next thing. 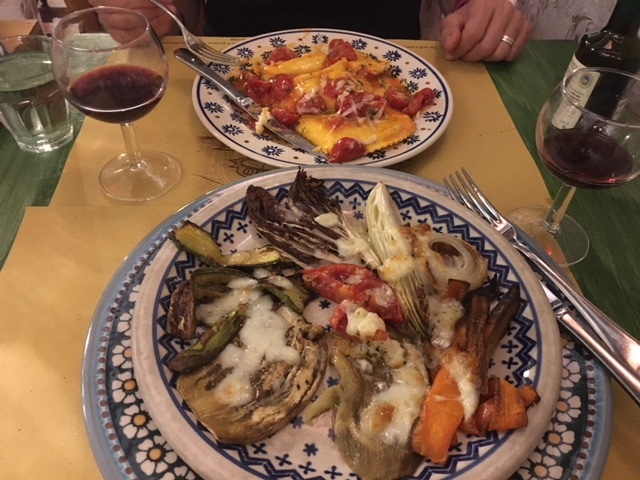 Slowing down and embracing not just the food, but where it came from, how it was prepared, and who I shared it with, became a rich experience, not just a quick way to get full. 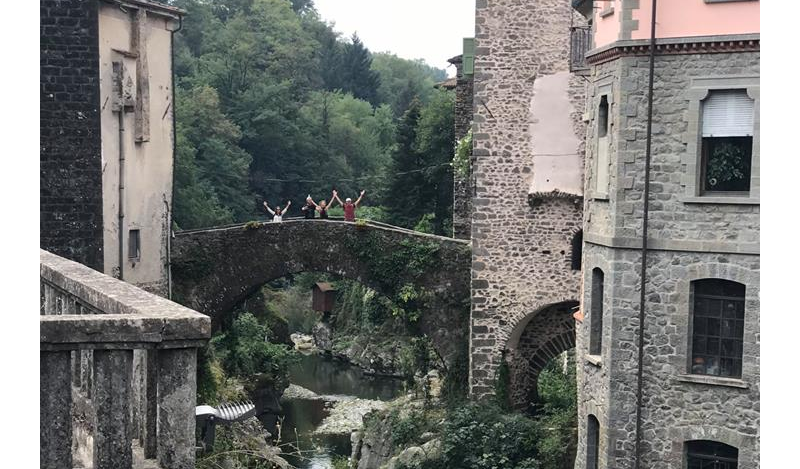 I knew Italy was full of rich history and art but I wasn’t prepared for the constant surprise of beautiful views, medieval structures and historical ruins literally around every corner. 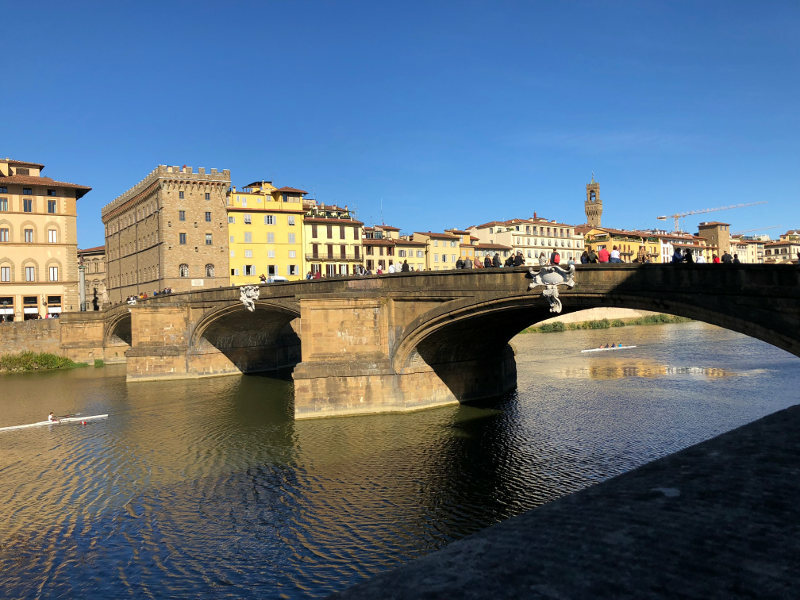 The Italians are very proud of their heritage and go to great lengths to preserve it, illustrated by the Holy Trinity Bridge in Florence that was destroyed in WWII and reconstructed by retrieving the original stones from the river. With all the change we are experiencing today politically, technically, and generationally, (just to name a few), it’s easy to dismiss our heritage. I plan to appreciate the opportunities that surround me everyday because of the events that took place before me. 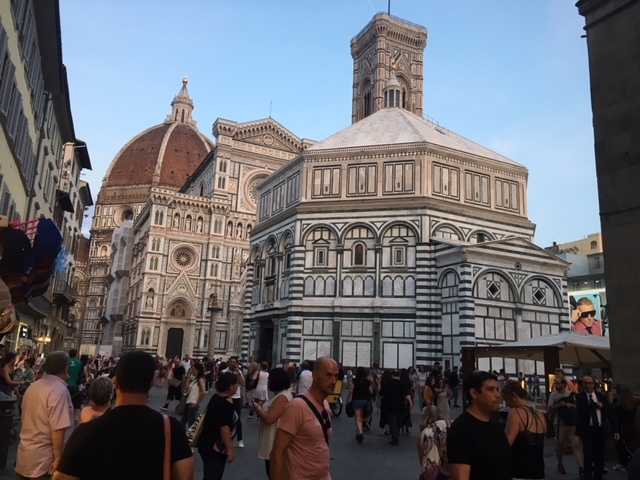 Many of the towns we visited were wrought with tourists, but the Italian men and women were easily distinguished, and not just because of their beautiful sense of style. They carried themselves with an authentic certainty about who they were and what their mission was, embodied by lovely Elena, host and owner at Le Pianore. We can get caught up in who and how we think we are supposed to be. What if you created your own life-style, from the inside out, focusing on what matters most to you? Choosing to live your most authentic self is surprisingly energizing and fulfilling. The Italian’s energy, passion, and emotion are infectious. 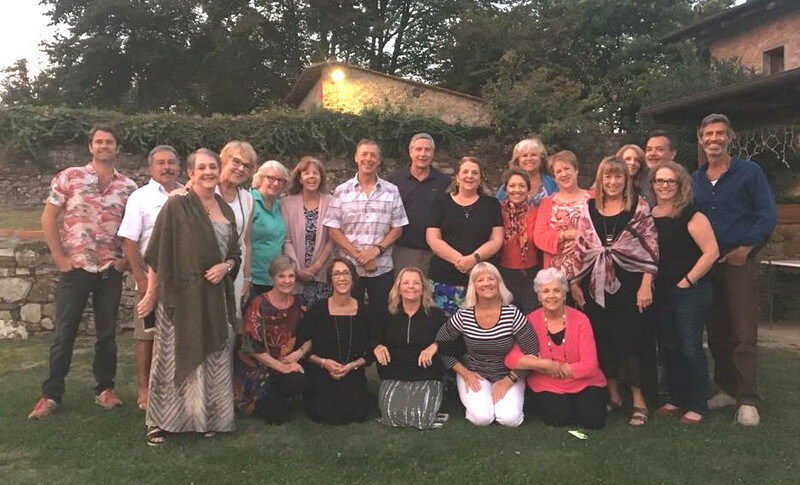 The last night of our first retreat, as we celebrated with a pizza party, Bev, a participant said, “If you had any space in group two, I’ would keep going!”. We actually did have a last minute cancellation and Bev changed all of her travel and life plans to join us for the second retreat! 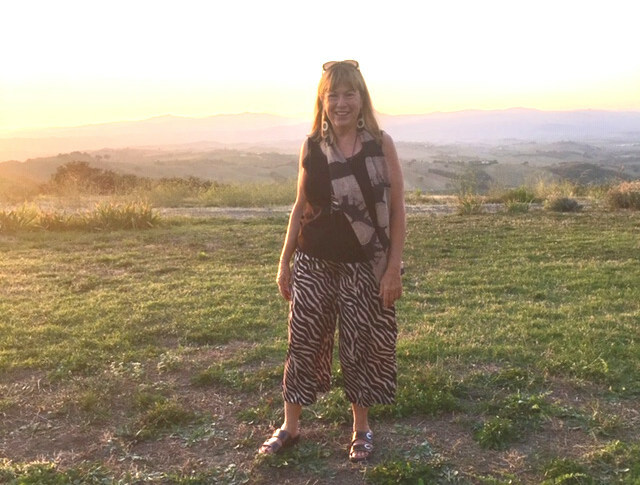 I think Bev not only connected with our Italian hosts and retreat participants, she connected with herself in a special way she wanted to continue. She later said, “This retreat filled up the senses in every way possible. It was a love affair where I fell in love with everyone and everything”. 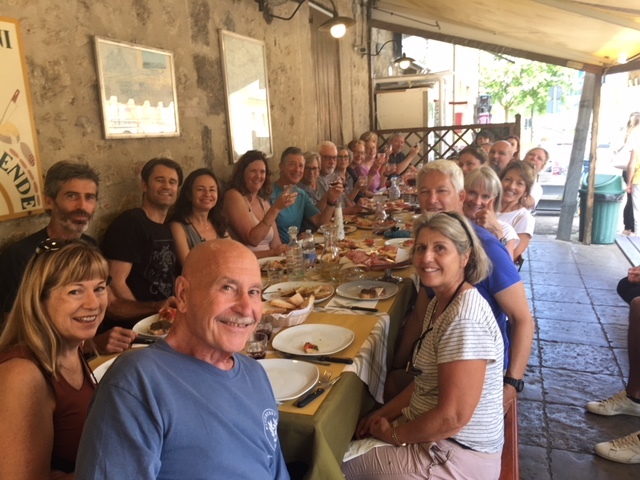 Whether we are in Tuscany or Denver or anywhere else, we all need an exploration of the senses to keep us learning and open to the surprise about ourselves. I am happy to be home to process this rich experience and see myself and my life through new eyes. I have my fiancée Neil, my adventurous retreat participants and the beautiful Italians to thank for this. What a wonderful surprise for all of us! Congratulations on your engagement! He’s a lucky man and it seems like you are blessed too. I went on a Franciscan Pilgrimage in Assisi and Rome, Italy and it changed my life. I had a few experiences that I will cherish forever. Blessings to you for all you do for so many. Much love and respect, Diane. Thank you so much for your kind words Marci. WOW Jule! Thank you for your kind words and following me all these years! I am happy to hear you are living an authentic life. Bravo! What a great trip!! Congratulations! We are so blessed and grateful to have you as family. Thank you Kate. I feel the same way. How fabulous!! I’m very happy for you & Neil. I wish you many, many more years of happiness together. Thank you so much Ann and great to hear from you. I was just thinking about you and here you are! Congratulations, Diane! What a great trip and thank you for sharing your insights. Thank you so much Jackie! I hope you can join us for an adventure in the future.